The first two natural kitchen cleaners that I will recommend are two dish washing items that I absolutely could not live without! I was amazed at just how effective they are, and while I do keep some Finish Quantum on hand for when we have a large load of SUPER dirty/fishy dishes, they have been my go-to for everyday dishwasher loads for over a year and I don’t see myself ever switching. I have used the Ecover Automatic Dishwasher Tablets both in the Zero and Regular versions, and currently prefer to buy the Regular just because it comes in a larger box with 45 tabs and ends up being a little less expensive per load. Other than that I find them to be equally effective. The Regular tabs have a subtle citrus scent out of the wrapper, but nothing remains on the dishes after the wash – this is very important to me, since I HATE it when you can taste/smell detergent residue in your water from a “clean” glass. In our inexpensive Maytag dishwasher these tabs do an incredible job of cleaning, and on top of that they get good ratings from both Good Housekeeping (performance) and EWG.org (environmental effects). The price as of October 2014 is around $6 for a 25 count box and $10 for a 45 count box, making the tabs around $0.23/load – just pennies more than conventional tabs. If I had to give up all green cleaning products but one, this would be what I would keep! Tip: If you have a regular American dishwasher which gets hot water directly from the water heater, run the hot water faucet in your kitchen sink till it gets very hot and only then start the dishwasher. That way you’ll get a truly hot wash from the very beginning – this is especially helpful in the winter in northern states. We have moderately hard water, so adding a rinse aid to the dishwasher is a must – it helps to eliminate any possible hard water spots on dishes that are otherwise present. I had tried a number of “green” versions (including the Ecover one), but in my opinion nothing beats the Seventh Generation Free&Clear Rinse Aid. The price is about $5 for 18 fl.oz. (Vitacost currently has the lowest price – $4.69) – I find this lasts me about two months with the rinse aid level set to 2. In our water the Seventh Generation rinse aid gives results similar to Jet-Dry, only with a much better EWG.org rating. Tip: Some people recommend adding white vinegar to the rinse aid compartment for a healthy and inexpensive substitute, but I have read accounts of that adversely affecting the dishwasher, so I personally do not want to take the risk and prefer sticking to a store bought solution. I am putting these two together, because that is just how I use them – I fill a reusable soap bottle with about 2/3 of the Ecover liquid in one of their pleasant subtle scents (grapefruit and green tea is my favorite, although I cycle through all of them), add 1/3 of the Planet Ultra liquid and end up with a potent, barely scented cleaning solution that rivals Dawn in performance, and yet is completely healthy and safe. I find the Ecover liquids a little runny on their own, while the Planet is much thicker. Combined, I get the perfect texture! Same thing regarding scent – I like dish soap to be slightly scented, and while the Ecover is mild enough on its own, diluting it even further gives me just what I need. Both are priced at around $4 for a bottle, which is comparable to what you would pay for Dawn or Palmolive. Yet another one of my favorites that I have been using for years. If you are anything like me, you probably refuse to even touch smelly kitchen sponges. I used to go through a sponge a week, and still would have them smell bad! And then I found Jetz Scrubz – a jet black sponge that lasts for MONTHS and just does not get smelly as long as you rinse and squeeze it out at the end of the day. I have literally gone from a sponge a week to changing out the sponge once every 6-9 months. So while almost $8 is a lot to spend on one sponge, in the long run it is so worth it. The scrubbing side is not super heavy duty, however I normally just use Bon Ami (more about it below) if dealing with stuck on food. The only other downside is that the sponge can get cuts from knives, but I’ve learned to be careful. Overall, very happy and can’t imagine going back to disposable smelly sponges. As much as I loved how shiny Barkeepers Friend got our All-Clads, I would always have to wash the pans thoroughly with soap and hot water afterwards – otherwise I could feel a chemical smell and even taste. On top of that it’s rated F by EWG.org, so I decided to give some of the other powders a try and started off with Bon Ami. To my huge surprise, it cleans *almost* as well as BF, but with none of the harmful and caustic chemicals! It is now my absolute favorite scouring powder for cleaning our stainless sink, gently scrubbing off burnt on residue from frying pans, removing pitting stains from flatware and even getting the inside of the toilet bowl squeaky clean. Rated a solid A by EWG! I’m very sad that they recently did away with their iconic yellow and red packaging in favor of a more generic “modern” look, but what a relief that they did not touch the formula, and it cleans as well as ever. I had originally purchased this all-purpose spray in the Ginger Yuzu scent and it was waaaay too strong smelling for me to use in the kitchen. Fortunately, I didn’t give up on the whole line and decided to give the White Rosemary version a try. What a huge difference! It is not nearly as strong smelling as the Ginger Yuzu version, and it has a clean, herbal rosemary scent – perfect for the kitchen! I use this all the time while cooking, since it doesn’t interfere with the other pleasant cooking aromas. It is truly an all-purpose cleaner, but I use it primarily for the counters, ceramic cooktop, stainless steel appliances and of course to clean in the fridge. It cuts grease well, and is less streaky than many other similar sprays. This one is a real treat – the all natural pomegranate grapefruit scent is to die for, and while EWG gives this just a D rating, the Better Life website specifically indicates that the concentration of the questionable preservative Methylisothiazolinone is less than 0.01%, and that kind of disclosure makes me trust them. The performance is stellar as well – absolutely no streaks, shiny clean countertops, and have I mentioned how much I love the scent?.. 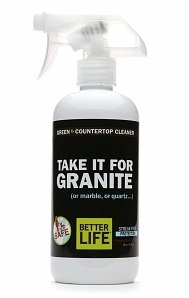 It is meant to be used on granite, stone, quartz, marble and other surfaces that need gentle, solvent-free cleaning. It is on the pricey side, at around $5.50/bottle, but it is one of those products that makes cleaning seem like less of a chore and I’m willing to pay a little extra for that! I’m actually so impressed with this cleaner that I plan on trying a number of other Better Life products. I use microfiber cleaning cloths for EVERYTHING, and after struggling for several years with some non-absorbent ones I had picked up at Marshalls I finally gave up and ordered a ton of Sinland and The Rag Company cloths from Amazon. What a huge difference!!! Not only do they absorb and clean perfectly, it’s also incredibly convenient to have so many on hand – I usually toss them in the hamper at the end of the day and once a week throw them in the wash with some towels. As with regular towels, these should not be washed with fabric softener – that coats them in a waxy substance and keeps them from absorbing liquid as well as they should. I tried both the regular and waffle weave microfibers and have a slight preference for regular – they feel like they “grip” the surface better, although the waffle ones do a spectacular job of polishing countertops. These come to around $1/cloth, and I would easily pay triple that for something so convenient and effective. How often do you find yourself having to wash strongly scented hand soap off of your hands in the kitchen before touching food?.. It has happened to me too many times, so now I stick to a staple: Ecover Ecological Hand Soap in Lavender and Aloe Vera. It is mildly scented with lavender – an herbal scent which does not feel out of place in the kitchen and rinses off easily and on top of that the soap is not drying or harsh on the hands. I have sensitive skin, so that’s always an important consideration for me. I also feel like the scent doesn’t “stick” to your hands, which is another reason why I enjoy it for the kitchen so much. These are all the natural kitchen cleaners I wanted to share today, however I will be continuing with a series of posts on other household cleaners and of course laundry. I feel like greener options are not only good for the environment, they truly make the process of cleaning more fun! *All of these products were purchased by me personally over the years, and I have not received any kind of compensation from the manufacturers for expressing my opinions. Just a reminder that if you are a first time Vitacost or iHerb customer, you can receive $10 off your first order and start exploring these and many other greener cleaning alternatives yourself! I have read that you should not wash microfiber cloths with terrycloth towels. The terrycloth is somewhat abrasive and it will wear the microfiber out faster. I keep a bin in my laundry room for the microfiber and put together a load when I have enough. That is actually a great point – thanks for the comment! 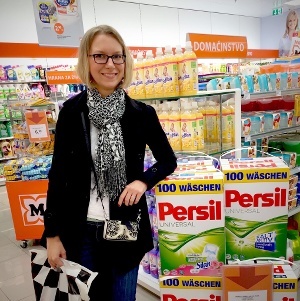 I also have been washing my microfiber cloths separately, and with Nellie’s Laundry Soda. I’ve read that regular detergents can cause buildup and smells in microfiber.